The big news this week in Bahrain is actually old news. Following the latest "unauthorized" protest by al-Wifaq in response to the opposition leader court sentences, first the Ministry of Interior and now the Ministry of Justice and Islamic Affairs is once again threatening to take legal action against the society. While the word "dissolve" has not yet been thrown around, the initial MoI statement confirmed that it "has taken legal action to file a case against Al Wefaq," whatever that means. For those keeping track, this is now at least the third time that the government has either moved to ban al-Wifaq (in April 2011) or seemed poised to do so (a few months ago in June) since the uprising. The newest campaign would appear to be led at least in part by ordinary citizens. Activists have been circulating an online "Petition of Popular Demand for the Application and Enforcement of the Law against al-Wifaq." Addressed to Justice Minister Sh. Khalid bin 'Ali and consisting of the standard fare about the need to crack down on al-Wifaq terrorists and saboteurs, the initiative is not signed by any particular group apart from "Bahraini loyalists." Coinciding conveniently with the anonymous online petition is a similar if more euphemistic statement by the Justice Ministry's High Committee for Islamic Affairs titled "A Statement by the 'Ulama' and al-Da'wa on the Matter of Condemning Violence and Sabotage." 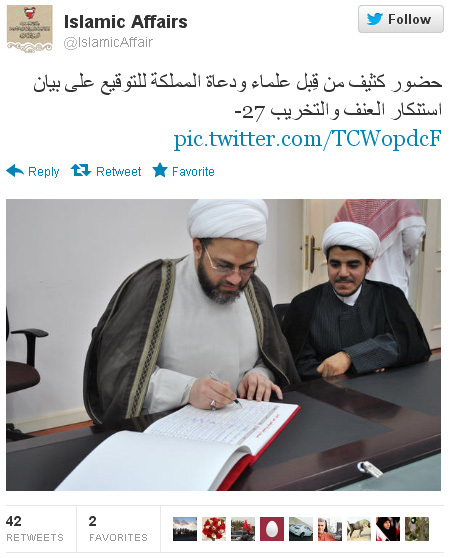 And, just so you're sure that this isn't a sectarian affair, the Justice Ministry's official Twitter account posted photos of both Sunni and Shi'i members of the committee signing the document. Of course, whereas the former photo of Sunni clerics was retweeted only 15 times, the latter--ostensible proof of Shi'a clerical disapproval for the (Shi'a-led) opposition--gained 42 retweets and various responses. Yet, notwithstanding the Justice Ministry’s seeming support for action against al-Wifaq, it is not clear what Bahrain’s rulers would gain from such a move at the present time. If the aim is strictly a security calculation rather than appeasement of public opinion (which I doubt), then certainly banning al-Wifaq, which remains the most moderate of an increasing number of opposition factions, is unlikely to achieve that goal. If anything, it would simply further convince al-Wifaq supporters (and erstwhile supporters) of the ultimate futility of its post-2005 strategy, pushing them toward more radical alternatives. But if, as seems more likely, legal action against al-Wifaq represents deference to those in society and in the royal court desirous of a harsher security crackdown, then still the timing seems wrong. Popular demands for “enforcement of the law” against al-Wifaq—i.e., a ban on (and appropriate security measures to physically prevent) its protest activities, and perhaps even legal proscription of the society altogether—are not new. Indeed, Al-Watan has been running stories and op-eds to this effect, decrying the machinations of "Bahraini Hizballah," for the past 18 months. So why heed them now? In the past month or so alone, Nabeel Rajab has been arrested and convicted, while the prison sentences of the main opposition leaders have been confirmed. Why expend all of one's political tools at one time? "A present from the Sunni loyalists of Bahrain to the February 14th Shi'a." A penetrating documentary linking al-Wifaq to Iran's Revolutionary Guard. This dilemma is but the latest evidence of the destructive, self-perpetuating nature of Bahrain's present political strategy, which I discussed in the previous post. Having successfully mobilized citizens against the opposition, the state faces increasing pressure to finish the job it started, by executing a decisive crackdown on protest activities and in effect barring the entire (Shi'a-led) political opposition. Yet, at least from the perspective of those whose position forces them to take a long-term view of politics--namely the king and crown prince--such an option can only be seen as a last resort. In the first place, it produces diminishing returns. Say, for instance, that al-Wifaq were banned. But now opposition activity continues and perhaps augments, not least in protest of the very decision to ban the group. So, after a few weeks, conservatives in society and in the ruling family again agitate for additional measures. What then? 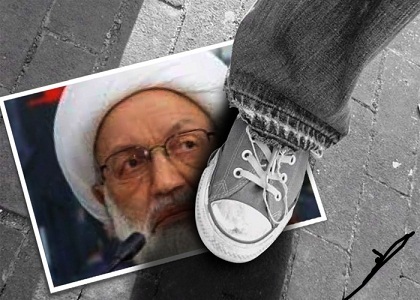 Arrest 'Ali Salman? 'Isa Qasim? Ban access to and from villages? What is the end game? It should be clear by now that protesters, most of whom now have one or another friend or family member arrested, injured, or killed, will not be deterred short of being physically locked inside their homes. The state's most recent "solution" has been to allow the opposition a defined space to protest--namely, along al-Budaiyi' Road--while attempting to block access to Manama proper. But how sustainable is this? Western housing compounds that used to be located along this route, including that of U.S. Embassy employees, have been abandoned in favor of "safer" areas in the northeastern quarter of the island. But at the end of al-Budaiyi' Road is the Sunni-dominated area of al-Budaiyi', al-Janabbiya, al-Jasra, etc. Do all of these people need to move as well in order to get to work on time? Will they not eventually begin to complain? And what of all the opposition strongholds in the south (Sitra, Nuwaidrat, 'Akar) and west (Karzakhan, Dumistan)? Where will be the "permissible" area of protest for these villagers? A second and no less significant question is whether it's even in the state's interest to rid itself of the formal opposition. Since al-Wifaq's departure from parliament, the body has assumed a decidely more confrontational posture vis-a-vis the state, as "pro-government" MPs no longer need to waste their energy fighting with al-Wifaq. Similarly, if al-Wifaq were banned as a legal opposition society, what is Bahrain left with? A loose coalition of genuinely pro-government tribal MPs, two Sunni Islamic groups--both affiliated with what are elsewhere powerful opposition parties: Salafis, and the Muslim Brotherhood--and two new Sunni movements in TGONU and Sahwat al-Fatih that may or may not represent a new opposition current. Oh, and Wa'ad sans Ebrahim Sharif. I think it goes without saying that this is not a political balance that favors the status quo. So why then the threat of legal action against al-Wifaq every few months? The answer stems in large part from another aspect of Bahrain's current political strategy (which I describe in a forthcoming article as "The Securitization of the Shi'a Problem in Bahrain"): in short, it can be imposed unilaterally by dissenting members of the ruling family. That is, by using their own position and resources to mobilize society against al-Wifaq and political compromise with the opposition generally, conservatives within the Al Khalifa can effectively foreclose options--say, a resumption of political dialogue--that might be preferred by other members of the ruling family, even more senior members. My article talks in particular about the post-uprising ascension of the khawalid. Yet one might now perhaps add another royal to this list, viz. King Hamad's son Nasr, who has been building a reputation for himself as uncompromising toward the opposition. (I've been told that he is held in particularly high esteem among members of the military establishment, in contrast to Crown Prince Salman, in no small part on account of the former's reputed involvement--true or false--in the torture of detainees during the State of National Security.) Some individuals with whom I've talked are even convinced that Prince Nasr is eying his brother's position as heir apparent. 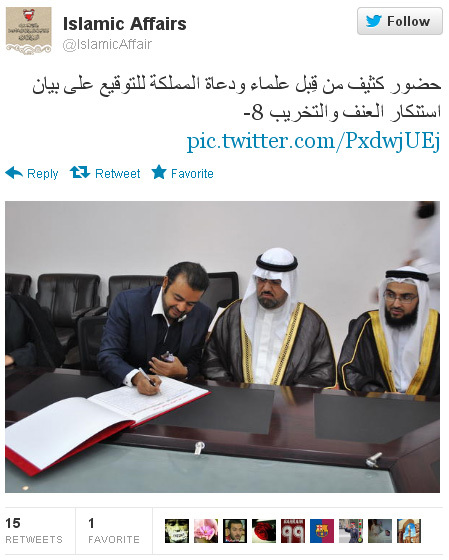 A Bahraini prince has stepped in to rescue a homeless family of seven forced to live in a rented car. Shaikh Nasser Bin Hamad Al Khalifa, the chairman of the Royal Charity Foundation, offered a house to the Bahraini mother and her six children after hearing about their plight and how they were kicked out of their home and had nowhere to go. Om Abdullah, the mother, said that she was deeply moved by the decision of Shaikh Nasser, the son of King Hamad Bin Eisa Al Khalifa, to assist her homeless family and rescue all its members from the relentless onslaught of difficult circumstances on them. Now, I'm not here to make fun of homeless families (assuming the story of the family is true--we are talking about Al-Watan after all), but I think everyone can agree that a bit of opportunism is at work here. While Salman is conspiring to bargain away the country to Shi'a terrorists, Nasr is putting his position to use helping poor people. Of course, if Nasr were really THAT great he would be out hang-gliding with endangered Russian cranes. I mean, seriously, be a man like Comrade Putin! In any case, Bahrain may soon have additional fuel for the primary debate here about the future of (the state's toleration of) al-Wifaq. According to this Al-Monitor story, al-Wifaq already has planned a new demonstration for this Friday along a contested route. Not to be outdone, the February 14th folks have organized an entire "Week of Loyalty to the Leadership" (presumably the opposition leadership), with a culminating demonstration planned for next Friday in Manama. 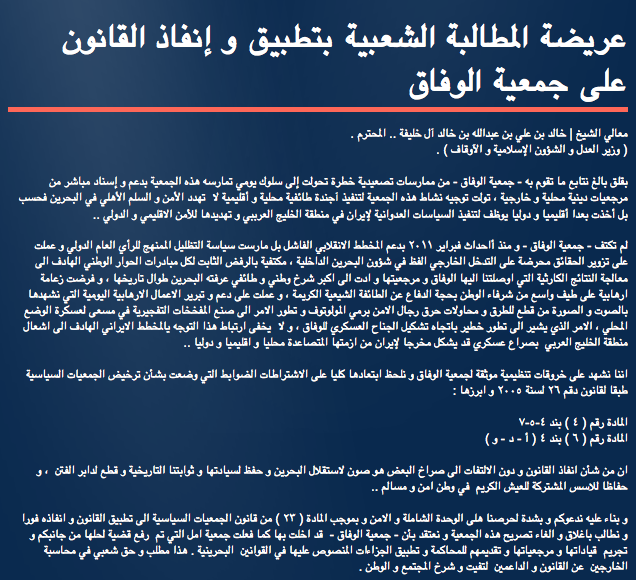 Update: Referring to a Sept. 9 press conference in which the Interior Ministry announced a new clampdown on blogs and forums due to what it called "defamation" of "national symbols and personalities," this thread in Bahrain's main Sunni forum asks "Are Sunnis the targets of the Interior Ministry's decision to prosecute blogs and forums?" Update 2: In Libya, another example of why the mobilization of Salafi citizens against Western and Shi'a heretics is not in the long-term interests of the United States. How long until the State Department exerts pressure to put an end to it in Bahrain?